THESE WERE SOME NOTES I WROTE ON A UNIVERSITY PROJECT A FEW YEARS AGO. This first dimension can be thought of as having two main facets: what the entry requirements are and what the delivery expectations are. The perception may exist, that in contrast to typical academic roles with high entry requirements, that administrative-type roles get similar grade recognition with “easier” entry requirements. This is further exacerbated by the fact that academic achievement (e.g. students graduating, books being published, papers being presented at conferences) appears more “difficult” than comparable administrative “achievement” which seems less visible and self-evident. A Junior Lecturer could be upset that she has a job grade (P9) which is similar to the job grade of most Secretaries. The fact that for the latter role the lower academic requirements may be offset by a greater requirement of actual work-experience usually does little to pacify this unease. This will always probably be a challenge in such an “inputs-focussed” trading/trade-off system: is an extra degree really “equivalent” to only three years (of any?) work experience? After all degrees, diplomas and certificates are supposed to be assessed against defined standards. But how does one usefully compare or evaluate the “worth” of one year of a particular individual’s experience to a different individual’s one year of experience? Even for a full professor (at Peromnes level 5) the “comparison” challenges do not disappear. They just veer more strongly to output-based considerations. Why top-level academics should be limited to a maximum grade of P5 is unclear. There are examples of top-flight academics whose contributions to institution-building (which top-level jobs are all about) are truly unquestioned. There is a group of academics – typically all internationally acclaimed in their different fields of endeavour – who without contributing to running the institution, are actually working on the institution’s long-term standing. Such jobs cannot be neatly “boxed” in a generic P5-sized job description. The “deliverables” are multi-year in timescale and complex (not strictly definable a priori). Such roles cannot be conveniently “contained” in tidy job descriptions. In fact, these academics would not even know or care, what is actually written or omitted, in such banal documents. One has to consider the total employee value proposition to apprehend the demand-side of the talent trading game. 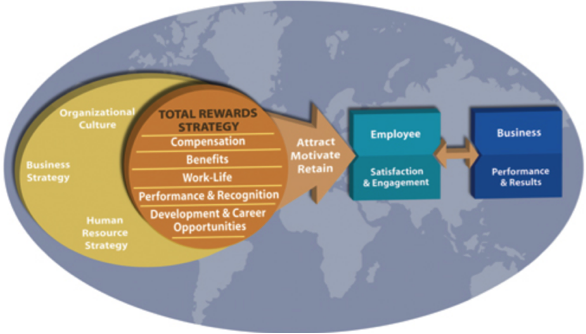 This picture from the well-known group WorldatWork about their respected concept of Total Rewards Strategy (TRS) is a useful waypoint on this journey of clarification. It places the TRS keystone centrally in between the “contextual” organizational factors on the left and desired “business” results and outcomes on the right of the picture. It is tempting to say that academics should be drawn more to the lower half of the five item list (around the world a few decades ago, this statement would have been taken as axiomatic!). But it is very useful to consider what the “essential” versus “desirable” employee value propositions are in the eyes of the stakeholders in the “academics versus administrators” debate. It is conceivable that the order of the essentials or must-haves is reversed for these two groups! So if #5, #4 and #3 in the list above are the top three “must-haves” for many/most academics, then “fiddling at the margin” with #1 and #2 (via job grades) is a very crude way of trying to “solve the problem”(that could also ultimately prove to be both expensive and ineffective). Hence Junior Lecturers (and full Professors) should not be comparing themselves against other “non-academic” employees on aspects #1 and #2 only. That is unless these academic roles have been gradually “reduced” – through attrition and inattention – to that of this comparison group. This could only conceivably happen once academics have lost most of their traditional perquisites such as academic freedom (the biggest “perk” by far), sabbaticals, oversees conference attendance, etc. In is instructive, even for university academics, to compare their career trajectories to other knowledge-worker groups in the private sector particularly when considering relative remuneration. If Junior Lecturers receive none of this “extra” value in your organisation (see #5 in previous section), then expect them to demand other more immediate and tangible rewards (of the #1 type) instead. What is the longest time-horizon of any “project” that you are leading/driving/ incubating/stewarding/marshalling? For really senior roles (P5 “upwards”) these time-horizons are three, four years and more…. What is it that you as an academic have essentially unfettered freedom to “build”? > A new research unit from scratch, perhaps? > Or an emerging and sustainable MIT (multi-, inter-, trans-disciplinary) teaching “platform”? This kind of creative effort takes years. And it only happens if the right-sized individuals step up to lead such pioneering efforts. In fact, universities exist mainly to enable and celebrate such enduring and innovative knowledge creation and dissemination. These vital protagonists (e.g. an A-rated research scientist) from the academic group should not in any way be deemed subordinate to the “directors of schools”; so if the latter’s role is graded at a P4, there is no sound reason to “cap” such academic forerunners’ job grades at P5. But if you do – and they usually do not care – then make absolutely sure you do not also interfere with the intangibles in their employee value proposition (primarily, professional autonomy or largely #3 and #4 from the TRS list above). For if you do, and they still remain, then they will reluctantly but unrelentingly demand more grade-driven perks covered by aspects #1 and #2 (i.e. compensation & benefits). Elliott Jaques’ extensive writings on stratified systems theory (SST), felt-fair pay, levels-of-work, time-horizons, capability maturation, etc.